I’ve been asked how I have time to find and read so many palliative care articles, both in academic journals and the lay press (the type of thing that ends up in Elsewhere in the Palliverse posts). Is my nose constantly pressed up to a screen? Definitely not. 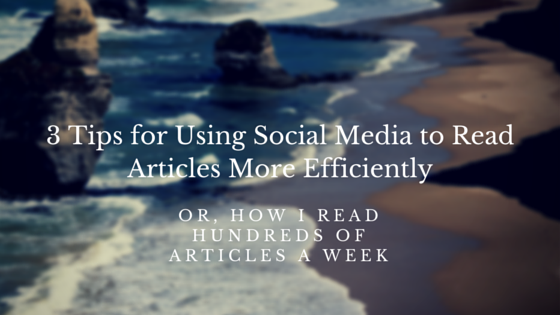 Below I will share a few tips on how to read more efficiently using free social media tools and apps. A screen shot of my “Health” unread articles list from feedly, as it appears in my web browser on my laptop. Step Two: Use a reading list app, like Pocket or Instapaper. Seriously, this will change your life. (Unless you don’t like to read, in which case, why are you reading this?) You add articles to Pocket to read later from your browser, your RSS Reader, or via other apps. When you read articles in Pocket, the text and photos are displayed on a plain white (or black) background, without all the distraction of advertisements. Links out of the article still work. In Pocket, you can tag articles and archive them for later. If I read something I would like to share in a Palliverse post, I tag it “Palliverse” and “to blog”, so it’s easy to find when I’m writing the post. 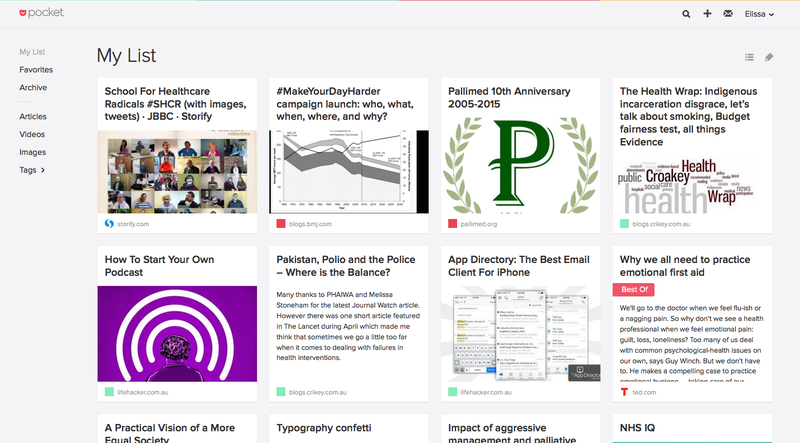 As with feedly, you can use Pocket in your web browser on your computer or via an app on your phone or tablet. You can also share articles directly from Pocket via email, Twitter, and more. You can even read your articles in Pocket when you have no internet connection, which can be handy for plane travel. For the more social media savvy: For Twitter users, I recommend my most-used IFTTT recipe: “IF I favourite a tweet, THEN the link from that tweet is automatically saved to my Pocket reading list“. 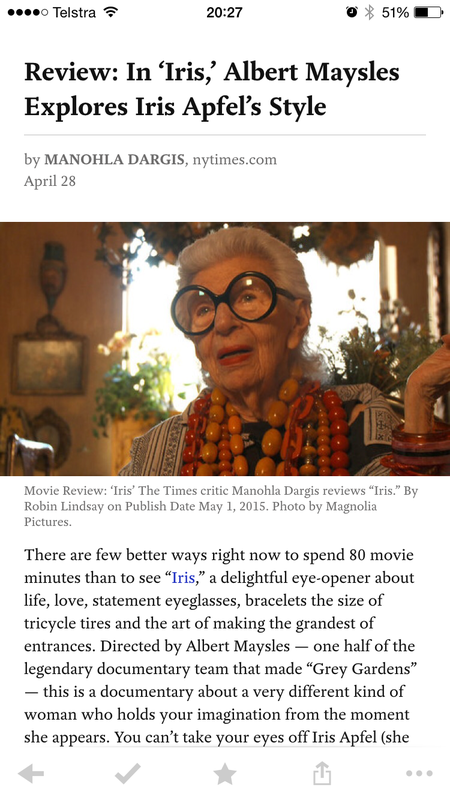 For example, see that Iris Apfel article in screenshot above? Someone I follow on Twitter posted a link to the article. Instead of clicking on the link and reading the article at that time, I “favorited” the tweet (which involves one touch of the screen) and the article was automatically saved to my Pocket, as it appears above. Other IFTTT recipes I use for Palliverse include automatically archiving posts to Dropbox and Evernote, and automatically tweeting from @Elissa_Campbell and @palliverse when a new Palliverse post is published. Let me know if you already use any of these programs, or if you try them out after reading this post. Please share any other tips for how you read, store and share articles. Finally, a heads up to Perth blogger Teresa Watts (Chi Garden), who first introduced me to Pocket and IFTTT (thereby changing my life). This entry was posted in Ideas, People, social media and tagged feedly, IFTTT, Instapaper, Pocket, productivity, research, social media, twitter by Elissa. Bookmark the permalink. Elissa, you ARE a genius!! Off to try all this…. Thanks Elissa for the life-changing post. I will certainly give them all a go. Now if only there was an app that could read the articles for you and produce summaries of them…maybe a product for the pallipreneur team to look into.